The restoration of Epulu and ongoing development of the Reserve in the face of quotidian threats and challenges has shone a light on the importance of sport — namely, football (soccer) — in the people’s lives and the OCP’s effort. 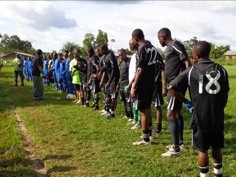 A simple game that in other parts of the world commands billions in business deals is, on remote fields in rural areas of the Congo, a near tool for survival, boosting morale and cooperation between communities and urging healthy competition among both adults and youth, boys and girls. 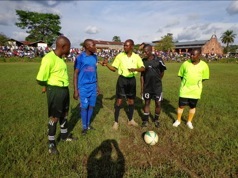 In mid-October, OCP, aka “Team Okapi,” sponsored a friendly between the Epulu and Mambasa men’s teams in Mambasa, on the eastern edge of the Reserve. 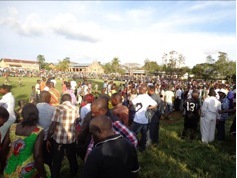 A huge crowd of 5,000, which included more than a thousand visiting Epulu fans, ringed the newly refurbished playing field, with motorbike taxi drivers buzzing about, urging on all the spectators, flying the Team Okapi flag in acknowledgment of the greater meaning of the day. Epulu had bested their opponents in their first meeting, several months earlier, but this day would be Mambasa’s, the final scoreline 2-0. Later in the evening, the teams, fans and community leaders gathered to reflect, enjoy refreshments, and socialize. Next up for Epulu: Niania, west of the Reserve. 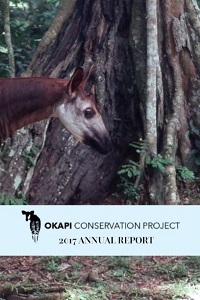 Team Okapi will make known the results.